← Women in the moon. I drew this street scene doubled over a window sill, looking out from my usual corner seat haunt in a downtown café last winter. Spring Garden Road, Halifax, Nova Scotia; a street I’ve walked up and down countless times. We all share a strong connection to the places we live, or have lived. The streets we walk, or have walked. Sometimes I’ll close my eyes and wander the far away streets I once knew, or climb the green hills that look out over the town where I grew up. What places are special in your mind? Thanks Rosie, I’ll be drawing more street scenes in the future. Russell. This is wonderful and evocative. The sky reminds me of those half-lit Canadian winter days, and the sense of place is perfect. Thanks for this beautiful reflection. Thanks Shirley! And you’re welcome. I appreciate your comments. Take care, Russell. This is great! Nice one Russell! Thanks Mr Hayashi, things cooling down over in Alberta? Very nice. A lot different from your mostly figurative work. Thanks Hansi. Yes, not a figure in sight. Hope you don’t hang up your blogging boots forever, Russell. Beautiful work, Russell. I’ve been thinking this weekend about South Africa because of Mandela’s passing. I went there in 1997 after a few years of living in London, and I’ve been remembering how happy I was to see the Southern Cross in the sky again, that the sun was in the “right” place in the sky, and the gum trees and so much else that was like my home country of Australia. Thanks Narelle. The world is a much poorer place without Mandela. I understand what you’re saying, even though I’m not sure what a gum tree looks like, we look for things that remind us of home and take comfort from them. I always feel at home when it rains for example: where I grew up it could rain for weeks. Thank you for taking the time to comment Narelle. Take care, Russell. tokyo. 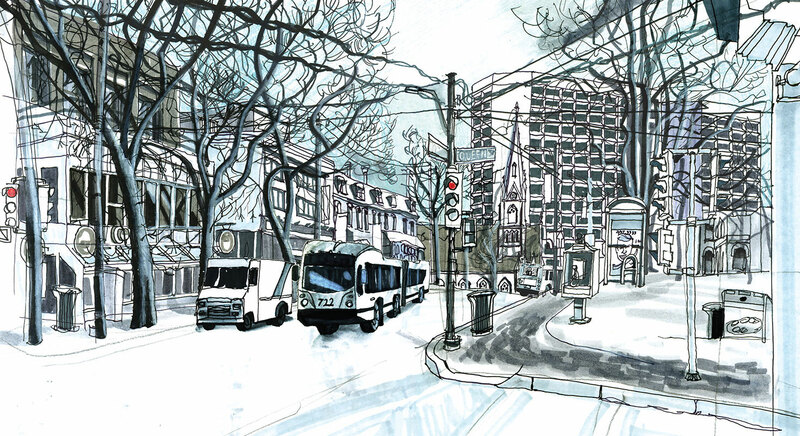 i wish i’d done some drawings of the city when i lived there. Tokyo, that’s somewhere I’ve always wanted to travel to and draw. That crazy street fashion, what do they call them? There’s a name for that style I think. And those mind boggling cityscapes. Maybe you’ll return someday. Thank you for dropping by, Russell. This is really beautiful Russel. Thanks Fredrik, you must miss Norway sometimes, then when you’re in Norway maybe you miss the U.K.? Regards, your friend Russell. Hi Rosa, thank you. Yes, we’re definitely creatures of habit and I think for those of us that have moved around a lot we establish these routes and routines very quickly, maybe because they give us some sense of stability in an unfamiliar place. Your English is perfect Rosa, thank you for writing and I look forward to seeing more of your local people and places. Take care, Russell. Yes, yes, I can feel that you know that place down to your bones, because you’ve perfectly communicated that delicate winter atmosphere, the shadows, the many branches and windows and all the beloved details that make up your feeling of the place. I have this for the old waterfront area of Boston, which has changed so much from when I first haunted it as a teenager, but still has that certain something I see and feel when I walk there now. I’ll try drawing it too. Thank you for this, it’s so beautiful. The red traffic lights! Thank you for your thoughtful comments Jacqueline. These places really do become part of us, I look forward to your Boston waterfront drawing, I have been to Boston but only passing through in the darkness of winter. I wish you all the best for Christmas, and thanks again for taking the time to comment. Kind regards, Russell.